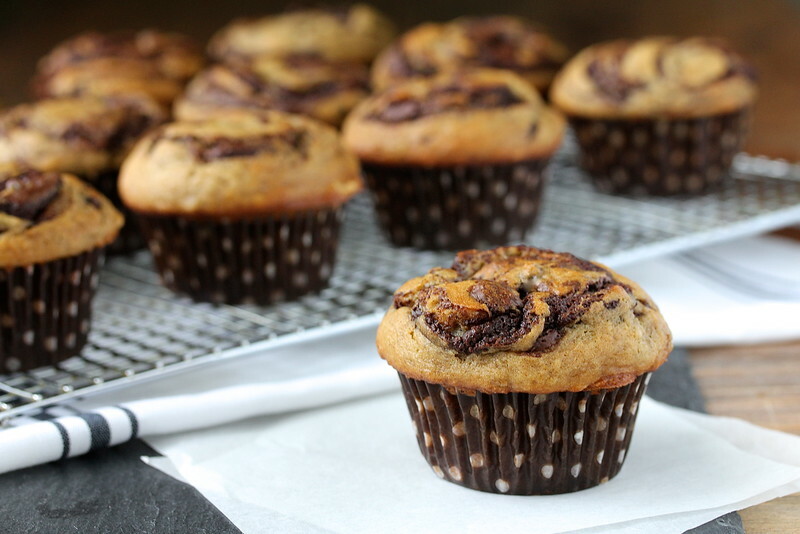 These Banana Chocolate Espresso Swirl Muffins are light and moist, and have a decadent swirl of espresso enhanced chocolate throughout the middle. 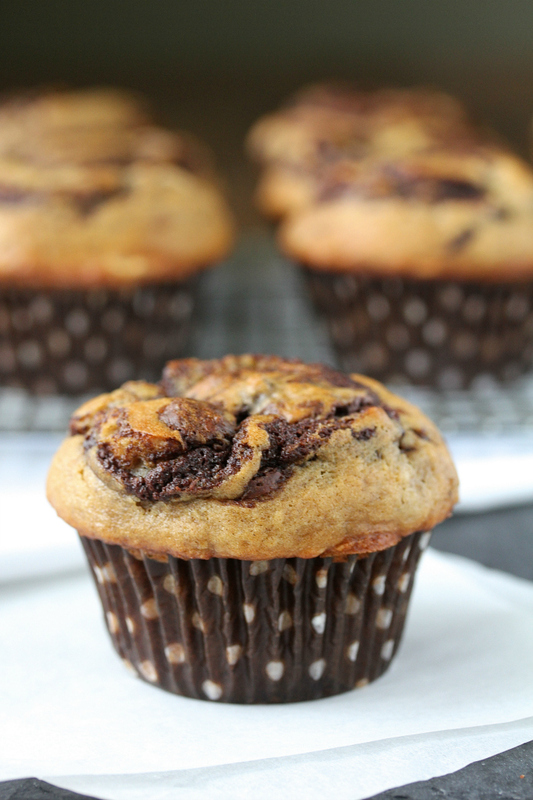 The flavors in these banana chocolate espresso swirl muffins take muffin-osity to a whole new level. I promise you, if you bake them, they will disappear. Plus, you will be very popular. These are the perfect excuse for having chocolate for breakfast. Of course, they'd be wonderful for a mid morning snack, afternoon tea, or even as a dessert after dinner. These muffins are really easy to make. 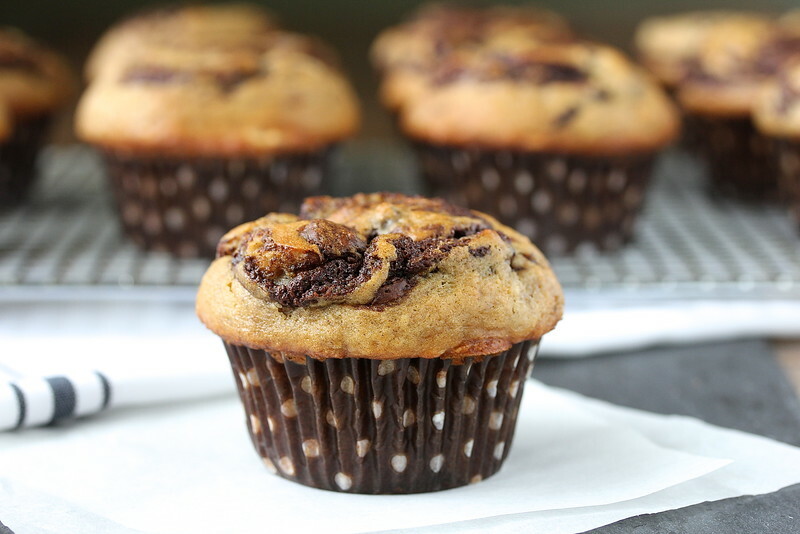 The hardest part is swirling the melted chocolate espresso into the muffin. The chocolate espresso mixture needs to be melted enough to be "swirl-able," but not overly hot. You definitely need to work quickly. Cuisipro measuring spoons. While you don't "need" these, I love these because they are oblong. They're perfect for plunging the chocolate into the middle of the muffins, and more convenient than breaking out a pastry bag and decorating tip. They also fit into most spice bottles. Mini Rubber spatula. This is perfect for quickly scraping the chocolate espresso mixture into the muffin right before swirling it. It's small enough that it doesn't mess with the muffin batter. I've love it also for scraping honey and molasses out of measuring spoons. Super handy. Quarter Cup Serving Scoop. I use this to portion the batter into the muffin cups. It makes it so easy. I can't tell you how many times I have used this scooper since I bought it. Note: I used liquid buttermilk, which I had leftover from making buttermilk dinner rolls and these black and white cookies. If you'd prefer to use buttermilk powder, whisk the powder into the dry ingredients, and add the equivalent amount of water to the wet ingredients. This is really handy, especially if, like me, you can only find buttermilk in one quart cartons. These muffins are amazingly light and moist, probably from the 1 1/2 cups of mashed banana incorporated into the batter, which, by the way, took exactly 3 bananas. I kid you not! Exactly. Three. Sometimes things just work out. 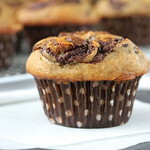 After the recipe, be sure to check out the rest of the muffins from my Muffin Monday friends. Preheat the oven to 350 degrees F and line a 12 cavity muffin tin with liners. Alternatively, spray the cavities with spray oil. In a large bowl, whisk together the flour, sugar, baking soda, salt, cinnamon, and nutmeg. In a medium bowl, whisk together the banana, eggs, oil, buttermilk, molasses, and vanilla. Pour the banana mixture into the center of the flour mixture, and mix until just combined. Portion the batter evenly among the twelve muffin cavities. Combine the chocolate and espresso in a microwave safe bowl, and cook on medium at 30 second bursts, until melted and smooth. Spoon a heaping teaspoon of the chocolate espresso mixture into the center of one of the muffins, and swirl with a wooden skewer or toothpick. Repeat with the rest of the muffins. Bake for 18 to 20 minutes, until a toothpick comes out without any batter on it (there will be melted chocolate). Recipe adapted from Bake From Scratch Magazine, The Bread Collection, 2016: This magazine is simply gorgeous. I bought it for the bread recipes, and found an amazing collection of muffin recipes as well. It's filled with incredible recipes, stories, and photography. 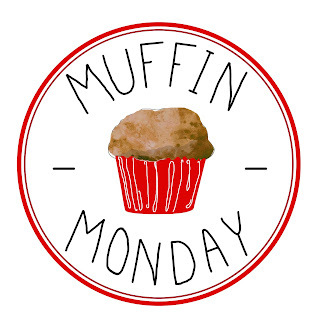 Here are the rest of this month's Muffin Monday bakes. Thank you Stacy for hosting this group! Your swirls are gorgeous, Karen! I have not had luck with swirls so I am always inordinately impressed by good ones. Love the flavors of your muffins as well! Thanks Stacy! I definitely had to work quickly. Oh my. These look so friggin' good. And those wrappers!! LOVE the paper liners you picked for these beautiful muffins, Karen! PERFECT! Loved the addition of coffee in this recipe! And your muffins look fantastic! Great work Karen! Thank you! You can't really taste the coffee, but it really enhances the chocolate. I bow before your mad swirling skillz! I bet the flavor combination is wonderful, and you've really done these proud. Thanks! Karen, these muffins are STUNNING! I know the boys in my home would love them, too.